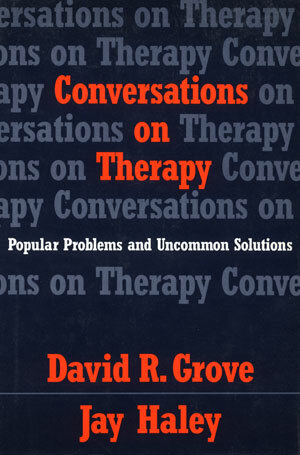 Conversations on Therapy - Description | W. W. Norton & Company Ltd. Imagine being able to consult with Jay Haley about difficult therapy cases. Grove, who trained for many years with Haley, has been in this enviable position. 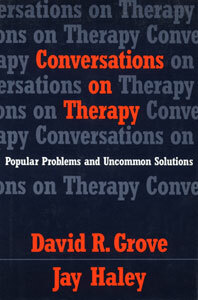 In this book, which Haley calls "not profound, but practical", the two authors discuss cases typical of what therapists in mental health centers face: serious and chronic problems, threats of family dissolution or violence, and involvement of several systems, such as the court and protective services. Grove presents provocative questions: Should he try to reunite a couple even though the husband has been violent in the past and may be again? How can one empower a stepfather who is inept and unemployed and acts like a teenager himself? When a woman can't remember much of her childhood and so suspects she was abused, is remembering necessary? How does a couple's current sexual relationship relate to past abuse? If one partner of a divorcing couple is having an affair, should the therapist help the other partner become aware of the affair - and how? Together he and Haley devise innovative strategies for these problematic situations. While starting with individual cases, the discussion ranges widely over the dilemmas that arise in hypnotic and strategic family therapy. Haley clarifies many of his positions, shows where his position has changed over the years, and introduces new techniques. This is a marvelous chance to interact with a master of psychotherapy.